An extravagant look she's destined to adore, these Pave crystal heart studs are breathtaking in design and detail. 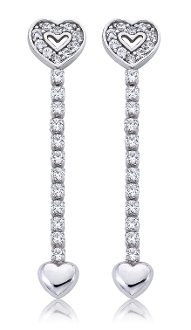 Fashioned in sleek 14 Karat white gold these earrings feature a pave crustal heart a flowing-string of crystals sparkle brightly with a highly polished puffed heart hanging below. Polished to a brilliant shine, these post earrings secure comfortably with push backs. Diamond carat weights (CT.), total weight (T.W.) of all diamonds, weight and dimensions of jewelry, color, clarity, carat and quantity of diamonds all represent the approximate in each setting and may vary than what is stated. Typographic errors are subject to correction. Merchandise enlarged to show detail and may not always be exactly as pictured. Promotions, prices, styles and availability may vary by store and online..